This week’s YouTube Tuesday features a quick trip around the Northern hemisphere. Our journey begins in Oslo, Norway with the band Pirate Love. Their song Lauging Gas has a certain Buzzcocks meets Bauhaus coolness. 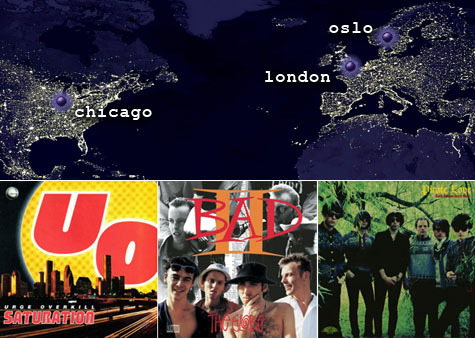 After Oslo, we’re off to London to check out Big Audio Dynamite and some V. Thirteen. We wrap up this little adventure with a hop over the ocean to Chicago and a visit with Urge Overkill. Climb aboard and check out all the sounds after the turn. EPM “Sodom and Gamorra, let the DJ play” Out! Urge Overkill… heavily listened to the Saturation album when I was younger. Such a good band. Same here, I loved some of those songs on Saturation. And that older album with “The Kids are Insane” (Americruiser?). Randy, remember when they wouldn’t leave your house?